Budget cuts have forced the New York Metropolitan Council on Jewish Poverty to trim its food pantry budget and lay off staff. NEW YORK (JTA) – In her 15 years at the Yad Ezra kosher food bank in Berkley, Mich., Leah Luger has never seen a situation quite as bad. Michigan has the highest unemployment rate of any state in the nation at 7.4 percent, and Yad Ezra has seen a 30 percent increase in demand over the past two years. With food costs soaring, Michigan’s only kosher food bank is struggling to keep up. Luger, the organization's director of development and co-executive director, says there is "more need, more desperation" than she's ever seen. Yad Ezra, which was started 18 years ago to help feed an influx of poor elderly Jewish immigrants from the former Soviet Union, now has a different clientele. Many are younger, working-age Jews who have lost their jobs or been blindsided by economic hardship. Two years ago, Yad Ezra served 1,000 families per month. Now it serves 1,400. Rising food costs -- 10 percent in the last few months alone, Luger says -- are compounding the challenge. A box of groceries that cost $36.50 in January now runs $39. "We are really struggling here," Luger told JTA. Luger is not alone. Emergency food providers everywhere are struggling, including Jewish agencies. Organizational officials describe the situation as a perfect storm: Food prices have increased by 10 to 20 percent, gas prices have soared to more than $4 per gallon, unemployment is rising, growing numbers of Americans are losing their homes to foreclosure, and state and local governments are slashing funding for social services. The crunch is coming from both sides of the socioeconomic spectrum of poor, they say. Food stamps, which help the poorest of the poor, simply do not stretch as far as they did a year ago. At the same time, a growing number of working poor and lower-middle-class Americans are being forced to turn to food banks for help for the first time. "In general, the entire country's food bank system is facing a crisis, and it is directly affecting all of the emergency food providers throughout the country," Heather Wolfson, a spokeswoman for Mazon: A Jewish Response to Hunger, told JTA. Mazon gives as much as $4 million per year in grants to some 300 organizations that either provide food or work in food advocacy. This year, for the first time, Mazon sent out a special mid-year appeal to its donors asking for more money, Wolfson said. 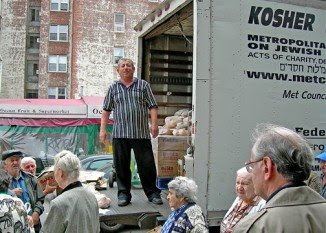 The New York Metropolitan Council on Jewish Poverty, which provides 13,000 families with non-perishable food through its food bank and food vouchers to another 2,000 families to buy perishable goods, has seen a steady increase in middle-class clients in the past three or four months, according to Executive Director William Rapfogel. Some middle-class New Yorkers hit hard by layoffs as well as the rising costs of rent, food and fuel show up at the Met Council's warehouse in the Canarsie section of Brooklyn. The warehouse is not a distribution center, but about a dozen people a day come anyway because they are embarrassed to seek help closer to home. Rapfogel says his budget has been slashed by more than $2.5 million this year by state and city budget cuts. Those cuts have forced the Met Council to trim its food pantry budget and will force the agency to lay off 34 staff members, he said. For those who receive food stamps, higher food costs mean they can’t afford as much food. "For a household of four that would have been getting the max allotment, by January they were already finding that they were falling $30 short per month," said Ellen Vollinger, the legal director for Food Research and Action Center, a national food advocacy group. "The new numbers we think will be more acute." Some 28 million Americans receive food stamps, which Vollinger estimates is only two-thirds of the number that actually qualify for the program. Hopefully the crisis will persuade government officials that they must help more, says William Daroff, the director of the Washington office of the United Jewish Communities federation umbrella group and its vice president for public policy. Daroff estimates that the federation system expends approximately $240 million annually on food and nutrition services, including food pantries, synagogue meal programs for seniors, Meals on Wheels, and an emergency food and shelter program. Approximately $60 million of the budget comes from government sources, he said. In May, Congress voted to override President Bush's veto of the Farm, Nutrition, and Bioenergy Act of 2007, which mandates an additional $10.3 billion in aid to federal nutrition programs. The UJC pushed hard for the measure, which will raise the minimum benefit for food stamps for the first time in 30 years starting in October. Jewish federations support about 100 food banks through the national system of Jewish Family Service organizations, according to the president and CEO of the Association of Jewish Family and Children's Agencies, Bert Goldberg. In Jacksonville, Fla., Jewish Family and Community Services partners with the Winn-Dixie supermarket chain to give away some 6,000 packages of supplementary food per year. The group has seen a 10 to 15 percent increase in demand, according to its executive director, Robin Peters. Meanwhile, rising food costs have forced Peters to begin to substitute lower-quality food in her packages. She used to give away cans of beef stew for protein; now it's beef ravioli. Local Jewish Family Services directors have been holding intense discussions about how to deal with rising costs and rising needs. While there is no national emergency campaign, Goldberg says most have started their own emergency campaigns to raise funds locally. Can they raise enough to keep up? "I hear frequently from execs that this is an issue that they don't know how to deal with," Goldberg said. Copyright © 2007, Deep South Jewish Voice All rights reserved.